This is one of my holy grail hair essentials. I can credit my lack of breakage at night to the satin pillowcase. I no longer wear scarves on my head (unless my hair is straightened). They make my hair flat, sweaty, and come off most of the time. All I do is put a satin pillowcase on my pillow and go to sleep. 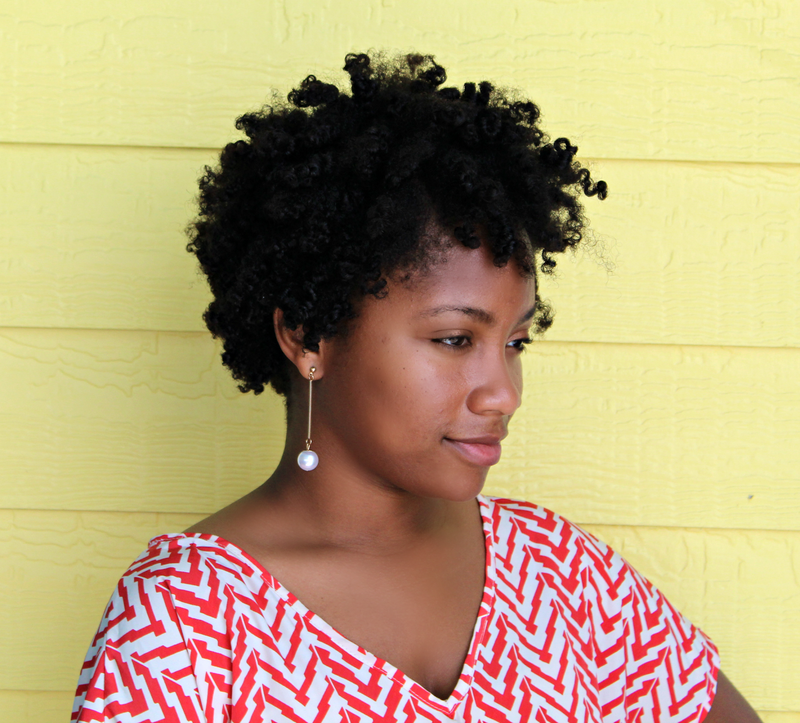 However, I do twist my hair at night and tuck away my ends for extra protection. Sometimes, I throw my hair in a high pineapple and sleep on the pillowcase. What I have found is that I have fewer tangles, less frizz, and I think it helps retain length as well but that's unproven. So, I wanted to share this goodness with you just in case you don't know about satin pillowcases or need a reminder. There will be a GIVEAWAY at the end of this post for this pillowcase I'm making. If you're interested in making one of your own, keep reading. First, take your fabric and fold it in half. 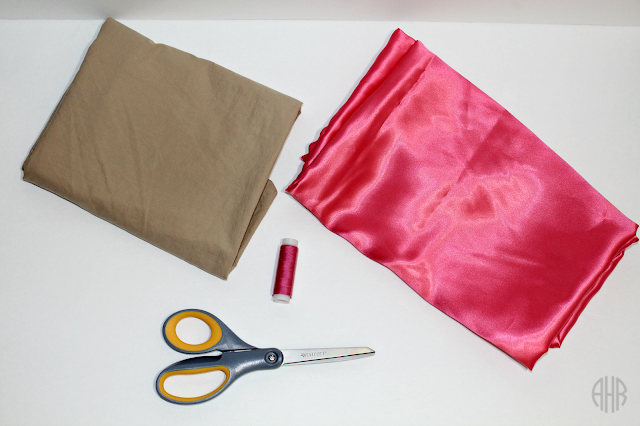 Then, lay your pillowcase on the folded portion of the fabric and pin it down. Next, cut the fabric to fit the size of the pillowcase. Leave 1 inch of extra fabric on the sides. Do not cut the fold. Here is what it should look like at this point. 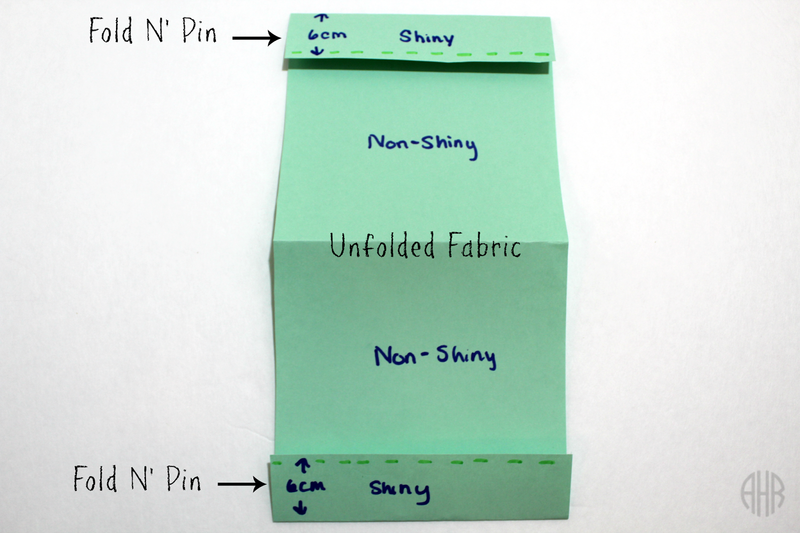 The end of my fabric is folded to fit the photo frame but check out the small thumbnail in the photo for accuracy. Next, unpin the pillowcase and put the pins and pillow case away temporarily. Unfold the fabric, Now, look at the fabric. It has a shiny satin side and a non-shiny side. Make sure that the non-shiny side is showing at this point. This next part can be a little tricky. Take one end of the fabric and fold it 6 cm back. 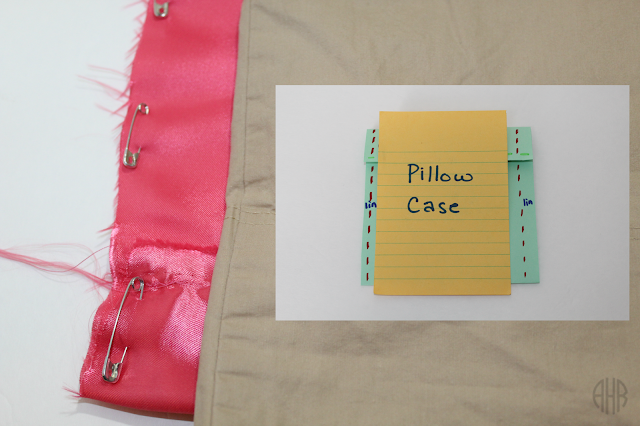 To keep the fabric in place, secure along the edges with safety pins. 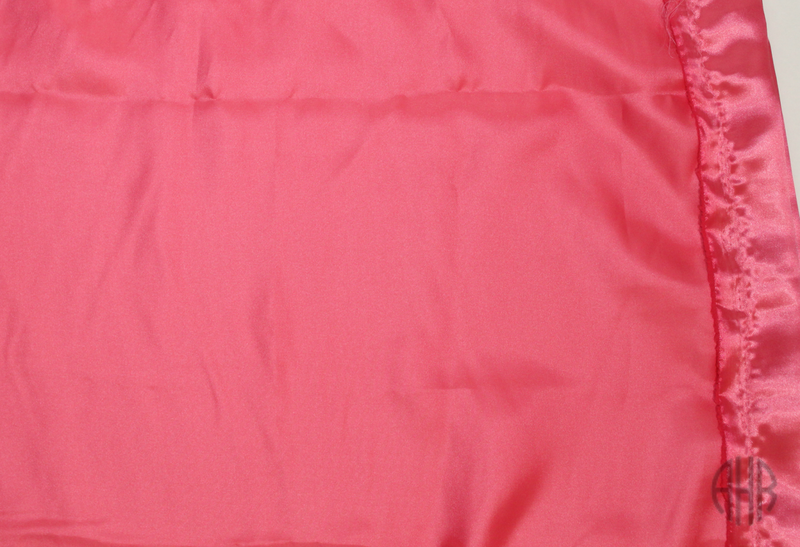 Complete the same process on the opposite end of the fabric. Non-shiny portion still up. Only the folded portion will be shiny. Next, sew along the line where you pinned, securing the folded portion to the rest of the fabric. make sure you sew about an inch or so away from the edge. 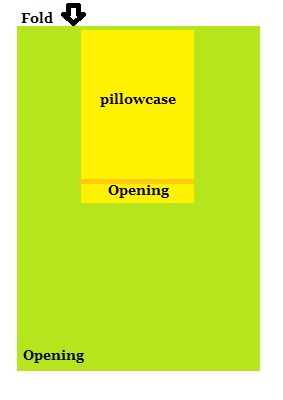 Remove the pins when done.The part that needs to be sewn is the green line pictured in the demonstration photo above. This is what the actual fabric should look like on both ends when you are done. Next, it's time to fold the fabric in half again with the non-shiny side still facing outward. Line up the two sewn shiny portions. Also, make sure to line up the edges of the fabric evenly. Now, take your pillowcase again and place it in the middle of your folded fabric. 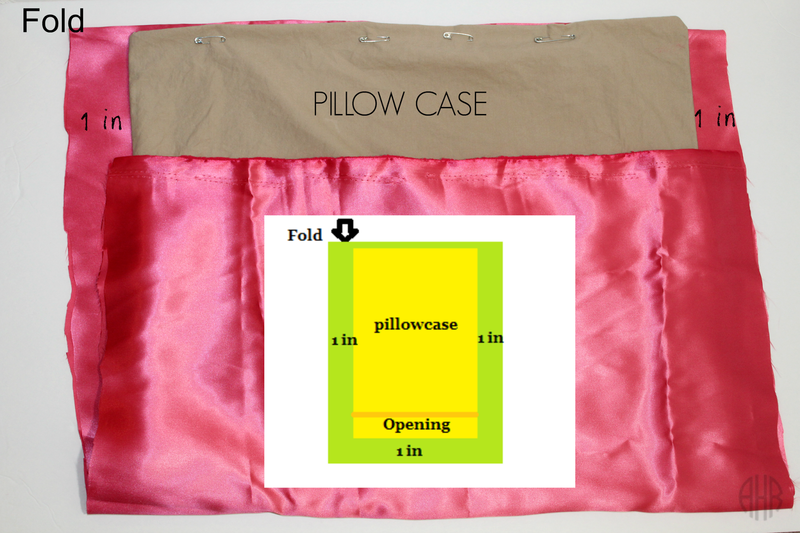 Pin all the way down the sides of the fabric where the pillowcase is not touching. The pins will serve as a guide for sewing. 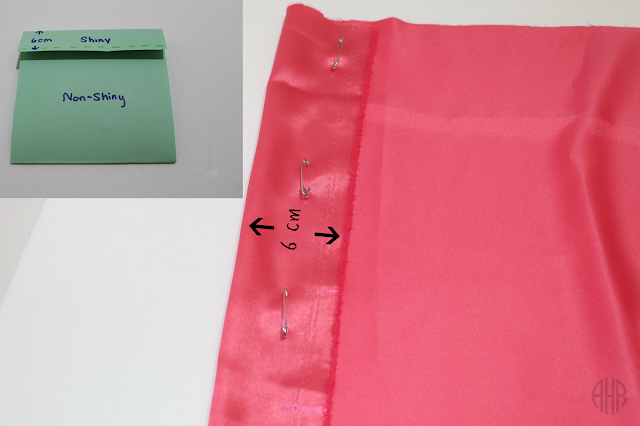 Lastly, sew along the sides of the fabric where the safety pins are (red lines in the diagram above). This step will sew the two layers of fabric together. Once you're done, take the safety pins out, and flip the fabric right side out to expose the shiny side. Then, Enjoy your frizz-free satin pillowcase. GIVEAWAY! 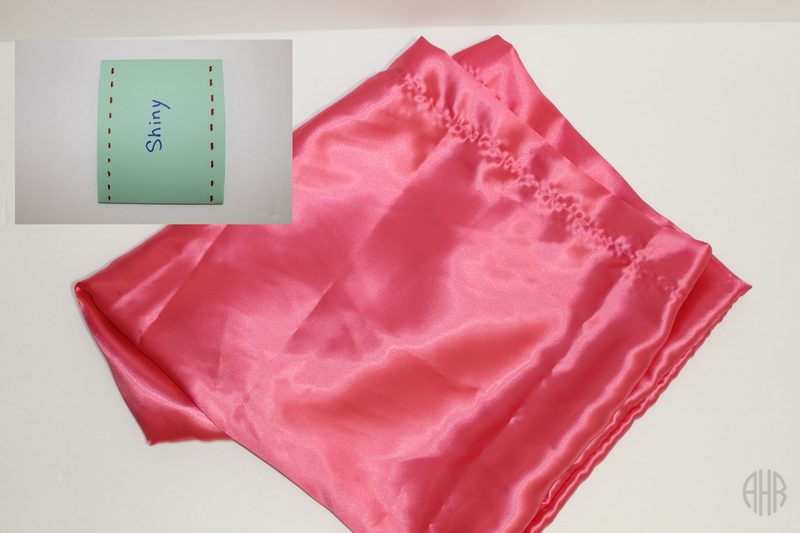 I already own a satin pillowcase that I handmade and I want to give this one away to you. Please enter the giveaway below to win this satin pillowcase. Good luck. 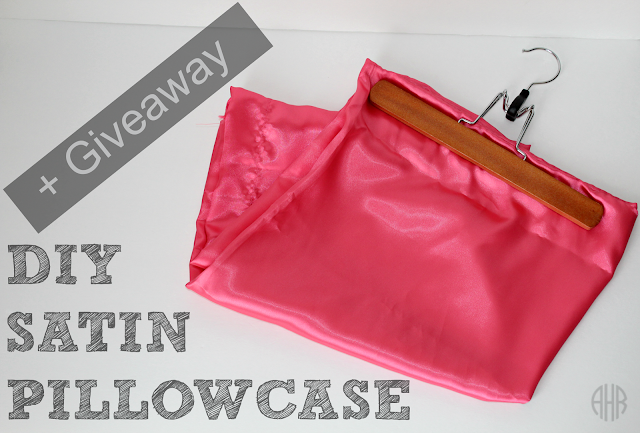 2 comments on "DIY Satin Pillowcase + GIVEAWAY (CLOSED)"
Such a cool giveaway! I love the pattern. It is so detailed. I entered. I hope I win!